However, it is more than a mere restriction of the desire; it is actually using the desire in favor of others. The same desires we have discovered within us—which worked only in our own favor, to cheat, lie, steal, and manipulate—have now come to a point of correction, cleansing, through the forty years in the desert until the entrance to the land of Israel. This is when we approach the stage of the inner work on the ego, the point where we turn the use of the ego into bestowal, in favor of others. This is considered that the angel of death has become a holy angel. It is a very different type of work. In this work, a person needs Judges and officers. The judges are the decisions that a person makes in advance, from the Rosh (head) of the spiritual Partzuf (face), the Rosh of the Neshama (soul). Judges are the premeditation concerning precisely how to work with one’s ego, how to manipulate it and set it up so that it gives its fullest power and turns all of its negativity toward the favor of others. Afterward one needs to establish officers over oneself, to not suddenly deviate from the way, since even if the decision is initially correct, one cannot tell the future. This is called the Guf (body) of the Partzuf, of the Neshama. The Neshama are those egotistical desires that one turns into the intention to bestow. If a person uses the desires according to the form of the ego, that person has no Rosh, nor does he or she need one because such a person is being pushed. However, if one wants to begin to use one’s desires in favor of others, one must first restrict them and then act according to scrutinies and decisions one has made before, through the light that reforms. When one uses one’s ego favorably, it is considered “repentance.” In that state, a person uses those desires only in favor of others, without any favors returning to oneself. The premeditation is called “Judges,” and the execution is called “officers.” These are two qualities of bestowal—one that plans the action (judges) and the other that executes them (officers). These are the same terrible desires that were in us before, and which we used only to harm others and benefit ourselves. These desires now become Yashar El (straight to God), Ysrael (Israel). They are called Eretz Ysrael, where Eretz means Ratzon (desire), and Ysrael means Yashar El (straight to God). This is how we advance, when our desire is aimed entirely toward bestowal upon the upper force, the Creator, through bestowal upon others. This is why we need the two forces—officers and judges—keeping us and tending to us, performing the right scrutinies. Previously, we have only the scrutiny of bitter and sweet. Sweet means what we wanted, and bitter means what we did not want. Here, however, it refers to another scrutiny concerning bitter and sweet—a scrutiny of true or false. Correcting the desires means changing them from caring for ourselves, from reception, into using them in favor of others. It is a correction from falsehood into truth, so it will not be bitter to us, but sweet. Truth means using the desire in favor of others even if it tastes bitter. It is called “making a Mitzva (singular of Mitzvot). Man is made of a desire to receive pleasure. There are 613 Mitzvot, which are the 613 desires in us, our 613 egotistical drives with which we exploit others. We should turn them into being in favor of others. There are two degrees here: one is called the “desert,” through which a person reaches the degree of Bina, bestowal, and the other is called Eretz Ysrael (land of Israel), the desire to bestow, when a person actually acquires, meaning corrects the use of all the desires with the intention to bestow. This is how a person becomes a Kabbalist—receiving the revelation of Godliness, which is our goal. It is the same for each person and for the whole of humanity. In truth, we are already in our final correction, in complete redemption. We transcend the egotistical use of our desires and qualities, and we elevate them into altruistic usage, in favor of everyone, and in favor of the upper force, the Creator. This leads us to the general correction of our desires, connecting us together so that each of us achieves the revelation of the Holy Divinity, the Assembly of Israel, through our correction in relation to others. When a person discovers that all of one’s desires are to use and exploit others, a person asks for correction. But does that mean that one desires to harm others? Of course we do not feel or understand if we should imagine ourselves as harming others, or perhaps agree that it is so, even if we do not feel this way. We tend to judges people by their actions. However, the majority of the transgressions discussed here are in the intention, and not in the action. We are unaware of them in our actions, too. We begin to see that we are committing these sins when we begin to move toward others. Mistakes and sins are only in relation to others. When we truly begin to act toward bonding, we discover how incapable we are, how we reject, forget, and oppose it, and how we are fooling ourselves all the time, even subconsciously. All of a sudden we discover that we have totally forgotten that the Torah behooves that we achieve bonding, love, “All of Israel are friends,” etc. It is a process that happens to everyone; we cannot achieve spirituality and observe the Torah whatsoever unless we follow the path of bonding between us. Judges are thoughts and desires that appear to us out of many others that are still buried in us. We more or less know our qualities, we can judge the state that they are in, and we can turn their aim in favor of others, or at least see how much we have no desire to give to others, and what felons we are. This, in itself, is a high degree. The wicked people in the Torah are not ordinary people. It is a high degree. The Torah was actually written for the wicked, as it is written, “I have created the evil inclination.” The Torah is intended for those with an evil inclination. If a person does not feel that he or she is selfish, a criminal, that person does not need the Torah; it is not meant for such people. By which law does the judge sentence? By which law is a person declared a transgressor? The judge is the individual. Once directed toward connection with others, a person begins to judge oneself: “Do I really want to connect with others?” That person scrutinizes why he or she wants to connect: What is the basis upon which I should observe that law? Is it clear what should be done? Has anyone told me that I should do it? Do I want the next world or this world? Am I hoping to gain something out of it? Or, do I really want to do it for the Creator without any self-gratification? Each step along the way contains many degrees on which we discover that we are evil. If we do not push ourselves toward bonding with others, we will not discover how opposed to unity we are. There is a lot of work before we reach the state of “I have created the evil inclination.” In that work we discover that the Creator has created the evil inclination in me, and besides it, I have nothing. We do not understand the nature of creation. Creation is the evil inclination. We are unaware of the extent to which we seek only our own good, and not the good of others. Moreover, the more others suffer, the more superior we feel, which gives us pleasure and fulfillment. It is very misleading. An ordinary person in a law-abiding society does not feel like a criminal if he or she did not do anything unlawful. True, but this is the corporeal, earthly life. Here we are talking about something else. If you want to discover the Creator, you need to turn your intention to bestowal, to love others. What if we said it to someone? We would be ridiculed, no doubt. It makes no sense, and it is completely untrendy. True, which is why we need to explain that today we must use the true Torah. The wisdom of Kabbalah is called the “true Torah”; it is the internality of the Torah because the light in it reforms. In other words, it is a method for the correction of the soul. We are in exile from the spiritual world, and we must therefore correct ourselves and discover spirituality, discover the Creator. This is the purpose, and the Torah was given to us so we would come to “know the God of your father and serve Him” (1 Chronicles, 28:9). In a corrected state will there be no judges and officers, no laws? No. Here, in this world, we have to live according to what humanity determines, according to what the people and the government decide. We should respect these laws because they were made by a hidden Providence. In this world we have to be like everyone else, “I dwell among my own people” (2 Kings, 4:13). However, within us, we need to come to know Him, to rise to the level where we somewhat resemble Him, if we wish to open our eyes in the Torah, if we want to discover Godliness and the upper laws, and to feel and come to know the Creator. We attain the revelation of the Creator to the extent of our Dvekut (adhesion), the measure of our equivalence of form. Can there be a match between the corporeal laws and the spiritual one? Yes, at the final and complete correction. Before that, certainly not because we determine corporeal laws according to our egos. The more we begin to keep these laws in spirituality, together, we will also want to project them onto the corporeal world. We cannot do it separately. Prior to the ruin of the Temple, when the people of Israel kept these laws, we kept them and also lived by them. Are there any officers in society today? No. Today officers and judges work by laws that people determined. It has no connection to spirituality. We also cannot establish spiritual laws between us because we cannot keep them. All spiritual laws deal with the love of others. These are laws of the general, global system, which is appearing today and is beginning to require us to keep it. But the current situation is to the contrary. People want justice but do not know how to implement it. The network of connections between us is appearing all over the world. We are all connected through it and we are all dependent on one another. This is why people sense the necessity for change, that they must do something. We all feel uncomfortable, nothing that we try succeeds, we are in states of crisis in our families, at work, in the education system, in culture, and basically everywhere. But this is something more internal. We often feel that crisis regardless of what is happening outside. It makes no difference; what matters is what we feel. On the outside things can be beautiful. On the whole, people are not starving, yet many are going out to the streets and raise a cry. They are unaware that behind their demands for social justice lies a cry from the lack of connection. This is the truth that is appearing in the world today. The world is manifesting itself as integral, global, as entirely interconnected. Yet, people feel disconnected and the lack of unity, and this is what awakens them to riot. The portion speaks of a king who must be chosen from among the people. If a king is an all-powerful ruler, how can we speak of kingship in that state? It is as if today the people were to democratically appoint a leader as king; it sounds completely unrealistic. When all the thoughts and desires work toward the land of Israel, to the desire for the Creator, the desire for comprehensive, mutual, and complete bestowal, a person chooses the foundation with which one influences everything. With that foundation, one reaches the Keter (crown), meaning similarity to the Creator in every way. We creatures are in Malchut (kingship), which is our big will to receive. The upper force that created us, on the other hand, is in Keter. We need to connect all our desires from the “people.” Out of the unity of everyone, we choose our most basic foundation, and call it a “king,” like King David, Messiah son of David, who is Malchut that reaches Keter. A king in Israel is not as a king in other nations, the way romantic novels picture it. Being a king in Israel is the hardest work there is. Is it about a person? The king is the supreme judge. He is the person to whom people come to ask questions, and he cannot turn away those who come to him. Does he also pass judgment? Yes. Maimonides and other sources write about that work, which is hard work indeed. Is it realistic to have a king in Israel today? The king is not one who sits on the throne. He is the supreme judge. The king is the one who knows how to arrange, bring together, and correct the most crucial decisions with the aim to bestow. He is responsible for the entire nation, for collecting all the people’s desires within him, and raising them up to the Keter. There is either a king in each of us, or a general king between us, raising us to the Creator and leading us toward correction. Messiah son of David is the one who pulls the whole of Malchut to the degree of Keter. Today people have no faith in the government; they want to take charge and make decisions. Is this a new phase emerging that will lead to the conclusion that people need a representative to speak for them? No. The people need to demand help from the government to receive education toward mutual guarantee. This is the obligation we received on Mount Sinai, when we were asked if we are responsible for one another, and if we want to be as one man with one heart. This is our correction—“that which you hate, do not do to your friend.” This is the stage of the desert. “Love your neighbor as yourself” is the stage called “land of Israel,” mutual guarantee, to be “as one man with one heart.” We must provide the education of mutual guarantee by ourselves, and to all the people. The government can help because it has the instruments, the resources, and the media, but it is the people that must demand it. What about the judicial system? Will we need officers and judges to keep the mutual guarantee? We will have to rebuild the system so it is an educating system, with people who advocate, like officers and judges, a sort of renewed Sanhedrin. The portion mentions witchcraft and divination. Why were they forbidden? Wouldn’t people change for the better if they knew where the world was headed? It is similar to what is said about Abram before he became Abraham, the father of the nation. He was engaged in selling idols, which is a preliminary degree that exists in each of us, in anyone who has not yet been corrected through a genuine disclosure of the evil inclination, because then one demands the actual spice for the Torah. The people of Israel learn about conducts during war. What is war? It is a struggle against the evil inclination. Man’s enemies are those that dwell with him in his home, those that are in his heart, meaning all the desires, thoughts, sins, and mistakes that he should turn into Mitzvot, into acts of bestowal. 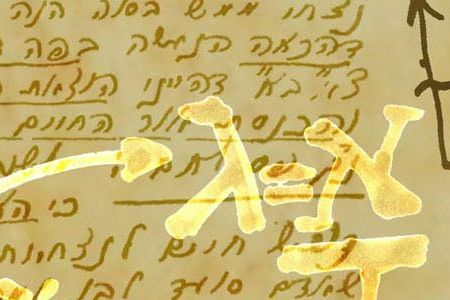 An act of bestowal is called a Mitzva (singular of Mitzvot). There is an endless war here, the Creator’s war with Amalek, which lasts for generations. But as a result, we built an army with an ethics code and values. We had no other choice. In the past, too, we had an army. So did King David, and so did all the others. As long as people have not been corrected, there has to be an army. If we were to change ourselves even a little toward mutual guarantee, we would immediately come and see that our neighbors all leave us in peace. After all, we are not doing anything that is fundamentally wrong. The minute we direct ourselves correctly toward love of others between us, within Israel, and begin to connect as before, in brotherly love, we will tilt the direction toward the positive, the mutual, and we will witness peace and quiet throughout the country, health, education, and the end of external or internal struggles.